Since Christ became sin, when we confess our sins are we confessing Christ?2Ps 32:5 AV I acknowledged my sin unto thee, and mine iniquity have I not hid. I said, I will confess my transgressions unto the LORD; and thou forgavest the iniquity of my sin. Selah. 3Ps 38:18 AV For I will declare mine iniquity; I will be sorry for my sin. 41Jo 1:8-9 AV If we say that we have no sin, we deceive ourselves, and the truth is not in us. If we confess our sins, he is faithful and just to forgive us our sins, and to cleanse us from all unrighteousness. 5Ro 10:9-10 AV That if thou shalt confess with thy mouth the Lord Jesus, and shalt believe in thine heart that God hath raised him from the dead, thou shalt be saved. For with the heart man believeth unto righteousness; and with the mouth confession is made unto salvation. Since Christ became sin, sin also died on the cross. Since the wages of sin is death,6Ro 6:23 AV For the wages of sin is death; but the gift of God is eternal life through Jesus Christ our Lord. and Christ died, what has become of sin?71Co 15:55-56 NIV “Where, O death, is your victory? Where, O death, is your sting?” The sting of death is sin, and the power of sin is the law. Since Christ became sin, did he become the verb sin? No, he was without sin,8Heb 4:15 NIV For we do not have a high priest who is unable to sympathize with our weaknesses, but we have one who has been tempted in every way, just as we are –yet was without sin. therefore he must have become the noun sin –the noun sin being composed of the sinful acts committed by others which Christ Jesus bore on the cross.9Ro 5:15-18 NIV But the gift is not like the trespass. For if the many died by the trespass of the one man, how much more did God’s grace and the gift that came by the grace of the one man, Jesus Christ, overflow to the many! Again, the gift of God is not like the result of the one man’s sin: The judgment followed one sin and brought condemnation, but the gift followed many trespasses and brought justification. For if, by the trespass of the one man, death reigned through that one man, how much more will those who receive God’s abundant provision of grace and of the gift of righteousness reign in life through the one man, Jesus Christ. Consequently, just as the result of one trespass was condemnation for all men, so also the result of one act of righteousness was justification that brings life for all men. 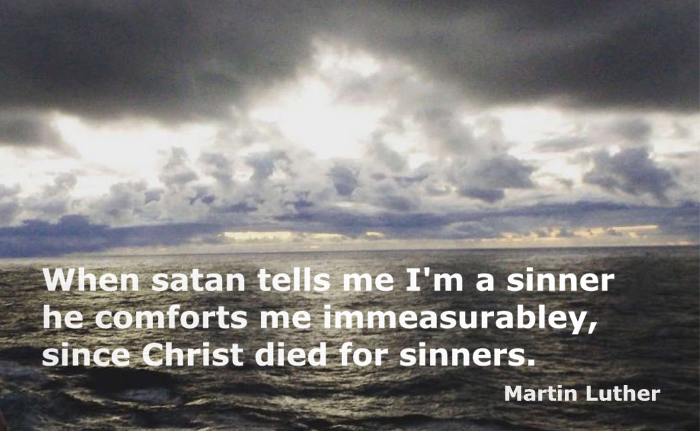 Christ was made sin for us. Christ was himself sinless. We are made the righteousness of God in Christ. Since the law came to make us aware of sin,10Ro 3:20 NIV Therefore no-one will be declared righteous in his sight by observing the law; rather, through the law we become conscious of sin. 11Ro 5:13 NIV for before the law was given, sin was in the world. But sin is not taken into account when there is no law. 12Ro 5:20-21 NIV The law was added so that the trespass might increase. But where sin increased, grace increased all the more, so that, just as sin reigned in death, so also grace might reign through righteousness to bring eternal life through Jesus Christ our Lord. did the law come to make us aware of Christ –our need for a savior? The law is only able to save those who have not broken it, consequently it condemns those who have. Once we have sinned the law is powerless to help us.13Ro 8:3-4 NIV For what the law was powerless to do in that it was weakened by the sinful nature, God did by sending his own Son in the likeness of sinful man to be a sin offering. And so he condemned sin in sinful man, in order that the righteous requirements of the law might be fully met in us, who do not live according to the sinful nature but according to the Spirit. Being aware of sin, and not knowing Jesus as Lord and Savior, brings condemnation however, once Jesus is Lord and Savior, conviction resulting from sin points us back to Jesus!14Ro 8:1-2 NIV Therefore, there is now no condemnation for those who are in Christ Jesus, because through Christ Jesus the law of the Spirit of life set me free from the law of sin and death. Christ Jesus is the light of the world.15Joh 8:12 NIV When Jesus spoke again to the people, he said, “I am the light of the world. Whoever follows me will never walk in darkness, but will have the light of life.” If confession brings sin into the light,16Job 12:22 NIV He reveals the deep things of darkness and brings deep shadows into the light. 17Mic 7:9 NIV Because I have sinned against him, I will bear the LORD’s wrath, until he pleads my case and establishes my right. He will bring me out into the light; I will see his righteousness. 18Joh 3:20-21 NIV Everyone who does evil hates the light, and will not come into the light for fear that his deeds will be exposed. But whoever lives by the truth comes into the light, so that it may be seen plainly that what he has done has been done through God.” does confessing our sins bring them into Christ?19 1Pe 2:24 NIV He himself bore our sins in his body on the tree, so that we might die to sins and live for righteousness; by his wounds you have been healed. Since Christ became sin, what has become of the sinner who is in Christ Jesus? Do sinner and Christian become synonyms in Christ?201Jo 1:10 AV If we say that we have not sinned, we make him a liar, and his word is not in us. Christ became sin to save sinners.211Ti 1:15-16 NIV Here is a trustworthy saying that deserves full acceptance: Christ Jesus came into the world to save sinners—of whom I am the worst. But for that very reason I was shown mercy so that in me, the worst of sinners, Christ Jesus might display his unlimited patience as an example for those who would believe on him and receive eternal life. Next Next post: Does God Send People to Hell?